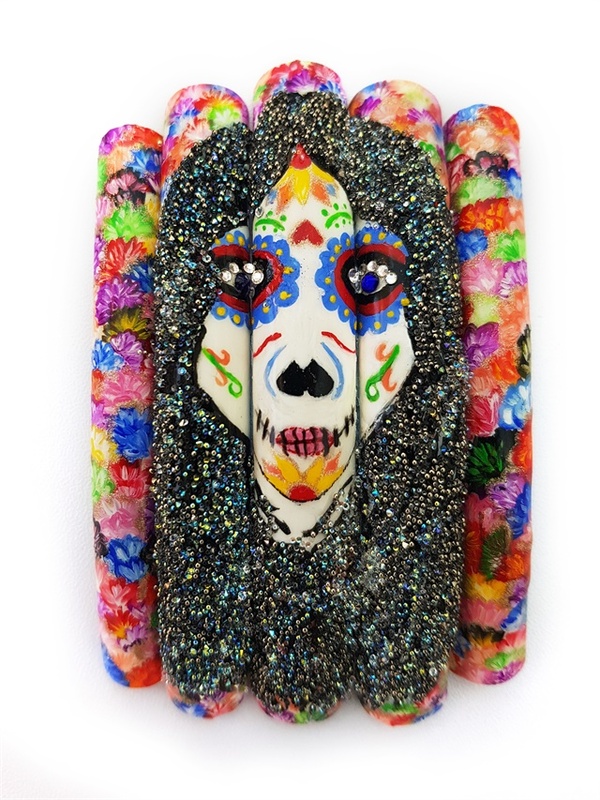 Day of the Dead is a holiday that is filled with artistic inspiration. Colorful flowers, sugar skulls, and other symbols found within Mexican culture make this day a vibrant celebration of life and death. 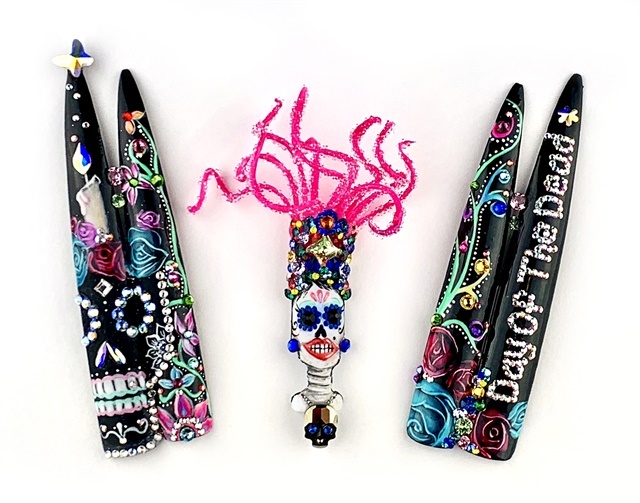 For the first pre-challenge of Season 6, we are asking our Top 24 to create Day of the Dead themed nail art on a 5 nail tip mural. The completed artwork must showcase crystal placement (at least 30% of the design should be crystal encrusted) and hand-painting skills only. Any size tips can be used and any Swarovski crystals contestants already own can also be used. A Nail Art Gallery tutorial should be completed showing the steps for creating this look. For each of these above five categories, you’ll give the contestants a 1-10 (10 being highest). There is a place for comments, but at this early stage, you don’t have to leave comments. But you can if you’d like. We will be eliminating 6 of these contestants this week, so please judge thoughtfully and carefully. You don’t want to see talented artists kicked off yet! Use the below three links for judging (we had to split the forms). Please submit your scores to me no later than 9 AM on Thursday, November 1. Pretty much every culture in the world has their version of a celebration of life and death. In Moldova we actually have a similar celebration of dead relatives and loved ones eight days after Easter. It is customary to bring the best home cooked food, wine, and candy and gifts for children. It is a sort of a family reunion and a day of remembrance at the cemetery among the living and the dead. But of course the Mexican culture takes it to the next level with an explosion of color and three days and three nights of celebration of life and death. My inspiration for this set was the beautiful sugar skull because it's the most significant symbol of this amazing holiday. To create a twist and incorporate more elements on just a five tip mural I chose to divide it down the middle and have day and night (sun and moon), dangerous and harmless (snake and dragonfly), and of course the dead and living (skull and beautiful girl joining the festivities). Because one of the rules excluded any other medium other than hand-painted nail art I decided to use as many products and techniques possible, a beautiful cobalt blue acrylic painted night sky, a light blue nail polish marble for the sky in the daytime, as well as the pink and yellow for the face make-up; neon yellow gel-polish for the skull and pink, red, orange and black for the rest of the design. I used gel paint for the detail to outline key elements of my design. Another part of this challenge was to showcase the amazing product provided by Swarovski and that was actually the best part because I just love working with them and pushing my creativity. The huge and absolutely gorgeous Eye Crystal was an instant inspiration and I knew that I can not only use it but make one of my own with some pieces I already had. Candles are a very important symbol for the celebration so I instantly thought about Swarovski Flame Crystals and Crystal Pixie in Cute Mood. The Pixie was also perfect for tiny details like the hair and spider web that gave the design a 3-D look, and completed the body of my snake. My favorite part was creating the flowers! The flames, raindrops and navettes perfectly mimic the beautiful petals and bring them to life. I also used multiple raindrop AB crystals to create the nose, wing of my dragonfly, the flame crystals were perfect for the flower petals, and random design embellishments. In Mexican culture, family members gather to remember and celebrate their family and friends who have passed away. The celebration consists of lighting candles and placing foods and drinks on an alter made for their deceased loved ones. As I researched this holiday, I was drawn to the vibrant colors and the elaborate headdresses worn during the celebration. I created my design around these elements. I chose brightly colored Swarovski crystals in different shapes and sizes to enhance my design. 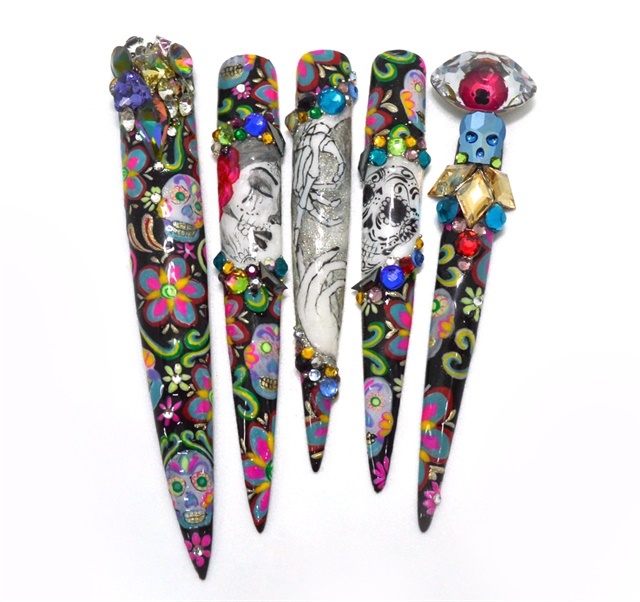 The centerpiece of my design is a skull and headdress nail tip that showcases the theme. 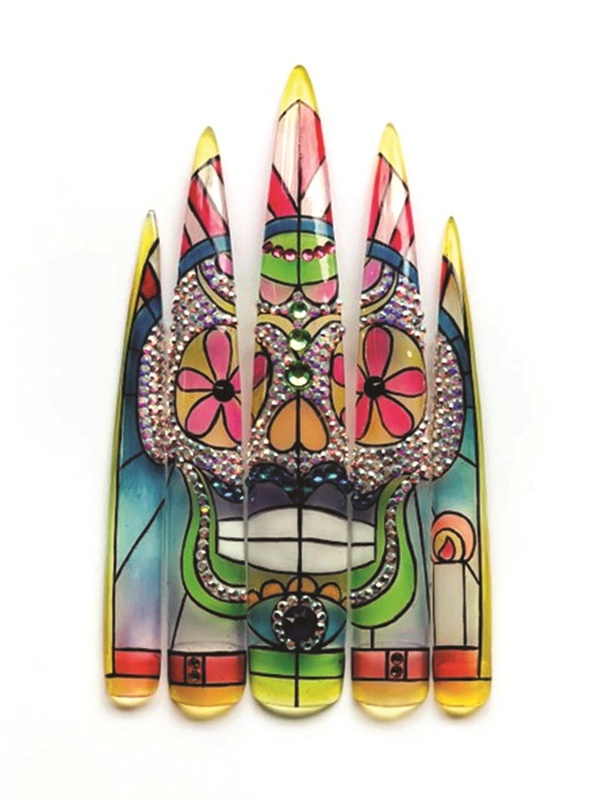 I carefully cut this nail tip to mimic the elaborate feather headdresses that inspired me. 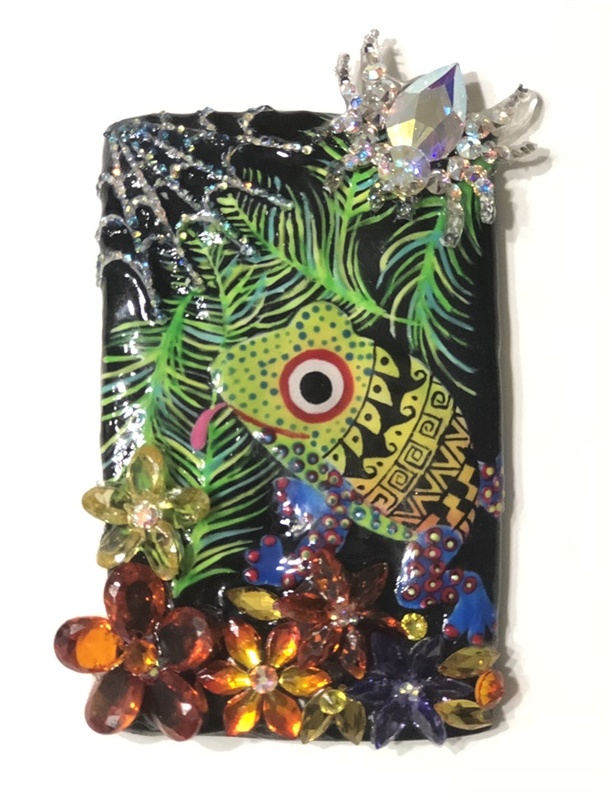 I used Swarovski Crystal Pixie to accentuate the feathers and Swarovski chaton stones in bright colors to complete the design. I gave her a crystal pixie necklace with a Swarovski skull pendant. Notice the Swarovski skull’s bright blue eyes. On the four remaining tips, I hand painted flowers using a combination of gel paint and gel-polish. The design was finished with colorful Swarovski crystals. 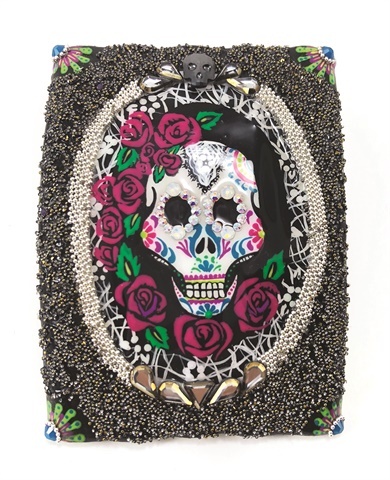 I included a black and white sugar skull that is adorned with various Swarovski crystals. A candle with a Swarovski flame was added to complete my design. The light from the flame transforms into a butterfly carrying messages of love. Day of the Dead is one of the days I really look forward to all year. This celebration begins October 31st and ends November 2nd; it is the day our relatives have the opportunity to visit us here in the land of the living. My art piece is dedicated to my beloved grandma, who played such an extremely important role in my life. Since her passing I started the tradition of setting up an altar with everything that she loved. My grandma really looks like “Mamá Coco” in the very popular Disney movie “Coco.” This movie along with other pictures served as an inspiration for my mural. I decided to draw my grandma in the center and beside her paint some beautiful colorful sugar skulls. The flowers in my mural are the three main colors used in flowers for the altar. A “Cempasúchil,” or marigold, guides their spirit to the altar with its beautiful orange vibrant color and smell. The white flower on top represents the sky, and the purple one represents the mourning praise and helps keep the bad spirits away. The candles in my piece represent the light use to guide the spirits to the altar. My grandma, was very religious and always had a cross necklace which I also included. The cross represents the four cardinal points that also help guide the spirits. To finish up my design I added Mexican embroidery and Swarovski crystals to tie the entire look together and give it a pop. Working on this project really touched my heart, I caught myself crying so many times as I was completing it. To me, it is such an honor to create this mural and dedicate it to my Grandma Zenaida whom I love and miss dearly. 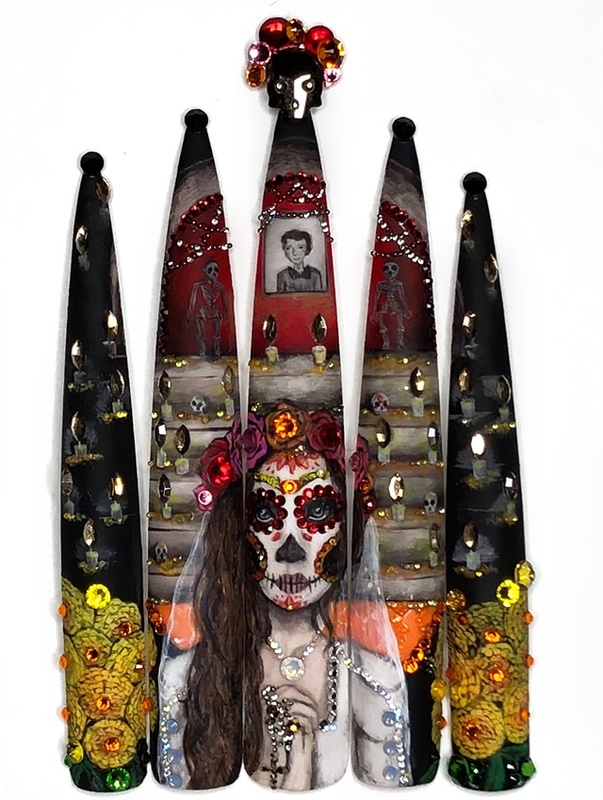 As I researched the Mexican holiday and the traditions surrounding it, I was inspired by the beauty found in death. All of the vibrant colors, florals, and imagery got me thinking about how I can best represent the holiday through my eyes. When researching the imagery and traditions for the holiday a few things stuck out to me for my pre-challenge. Marigolds, which are called Flor de Muerto, Flower of Dead, are the traditional flowers used to decorate the graves of loved ones because the vibrant colors and strong scent are believed to attract souls to the offerings. The traditional paper banners were used as a backdrop to add vibrant colors to the piece as well as signify the wind, which is one of the four elements commonly left for spirits. Finally for my centerpiece, I chose to go with the artwork of David Lozeau called ‘Celebration of the Mission’. The skeleton woman is so beautiful even in death and I wanted to represent that through the simple beauty of her face and body. I chose to crystalize her dress to emphasize and enhance the overall beauty of the piece. I feel that this first pre-challenge pushed me out of my comfort zone with hand painting. I researched new techniques for adding depth and dimension to my artwork, which I hope I have displayed with my mural. I would like to continue to push myself and see how far I can go with my artwork and technique application. Day of the Dead is a time to honor and celebrate loved ones who have passed on. Death isn't seen as the end of one's life, but as a natural part of the life cycle; the dead continue to exist much as they did in their lives, and are said to come back to visit the living every year during this time. I wanted my design to capture the merging of the living with the deceased, which is why I chose to paint living faces with skull makeup. I learned while researching this holiday that flowers symbolize life and spider webs symbolize death so I painted a floral design around the faces and created a Crystal Pixie spider web for balance. This holiday is also known for its vibrant colors, which I chose to portray through the use of Swarovski crystals. To allow the colors of the crystals to pop I kept my hand painting palette neutral with nudes and jewel tones. 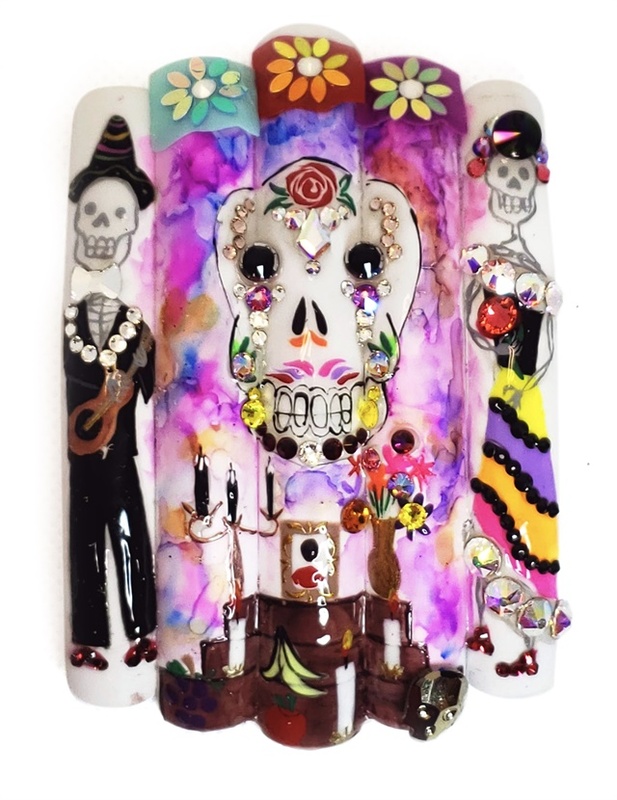 I have been asked to create Day of the Dead themed nail art mural on five nail tips. Thirty percent of the design has been crystal encrusted sponsored by Swarovski and Crystal Katana. The entire design has been hand-painted with gel. 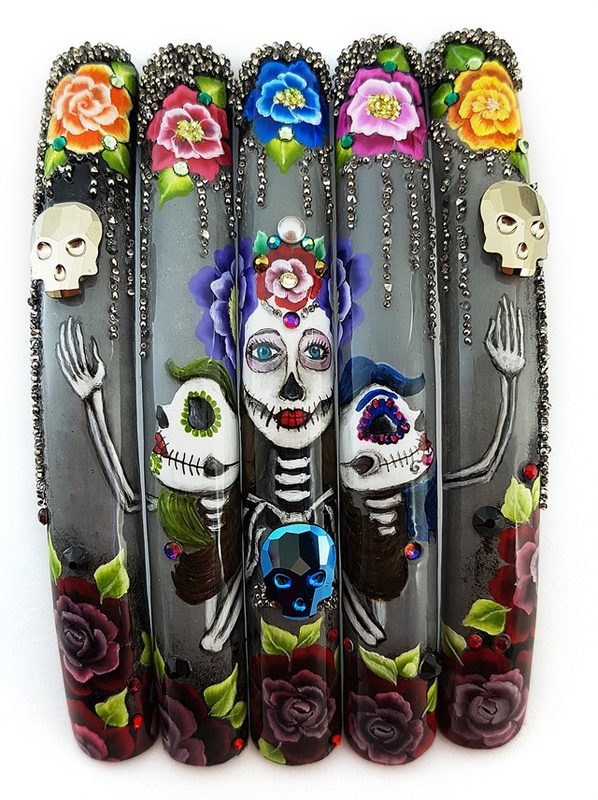 I found inspiration in symbols such as sugar skulls, colorful flowers, and Monarch butterflies (there is a belief that they hold the spirits of the departed). Dia de los Meurtos (Day of the Dead) is a time in Mexican culture to celebrate the lives of loved ones who have passed on. People celebrate by having festivals, decorating with bright colors and flowers, and most importantly by visiting loved ones’ graves and bringing them their favorite foods and gifts. Upon Googling Day of the Dead I couldn’t help but notice sugar skulls, in particular sugar skull cats. Being a cat lover I decided to make nails in tribute to my first pet ever, my cat Peanut. We got Peanut when I was 4 and she lived to be 20 yrs old! So she was a significant part of our family. Peanut definitely used all nine of her lives, so I decided to make an altar honoring Peanut. 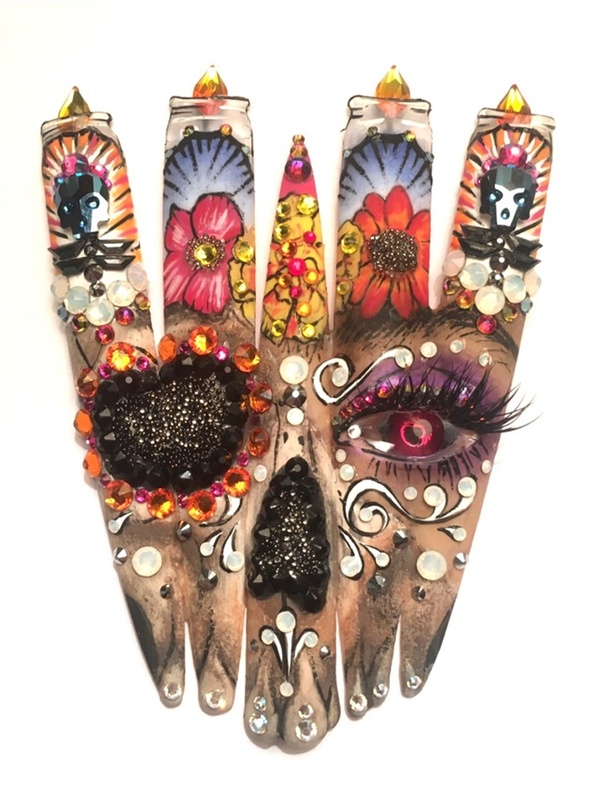 I made her into a sugar skull made completely of Swarovski crystals so that she could be the shining star of the nails looking over a cascade of hand painted Day of the Dead patterns (including all her favorite things) flowers and her seven little kittens. Día de Muertos is a Mexican holiday where loved ones gather to pray and celebrate the lives of those passed. At these gatherings they leave food and goodies to help their loved ones transitioning to the afterlife. I chose to use the sugar skull as my main focal point, they are usually on the altar and have the name of those who have passed on them. They were originally made from sugar because that was the least expensive material. The skeletons represent people in the afterlife enjoying themselves, so I have a gentleman playing the guitar for a young lady that he is courting. He gave her the rose and wrote her a special song. 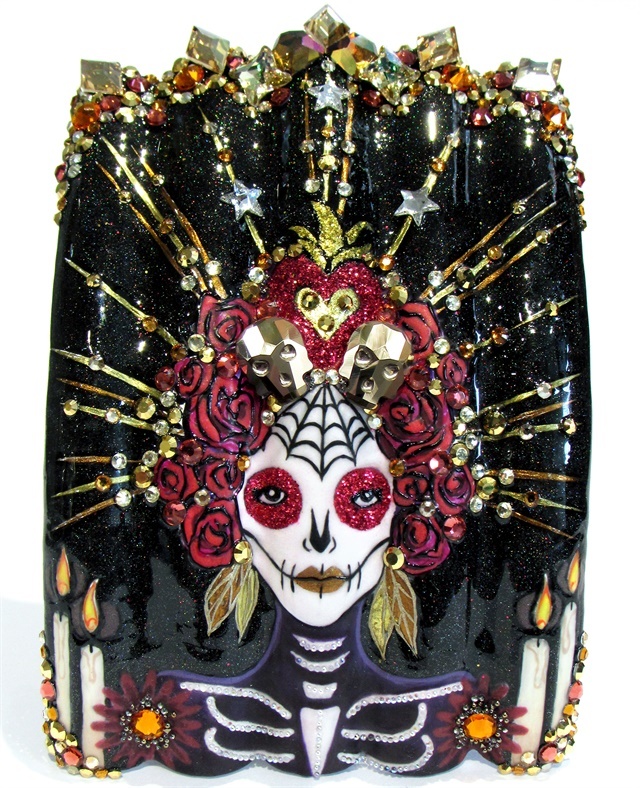 I layered in Swarovski crystals to accent the sugar skulls and the details on the clothing and the picados. I added in some watercolor effects to make the design pop with color and to reflect the happiness these two have in the afterlife. I was super excited when we received this challenge because I've always had a fascination with sugar skulls. I was drawn to a certain picture that showed skulls covered in detailed bead work. Each line was a different color, creating intricate details and mesmerizing designs. 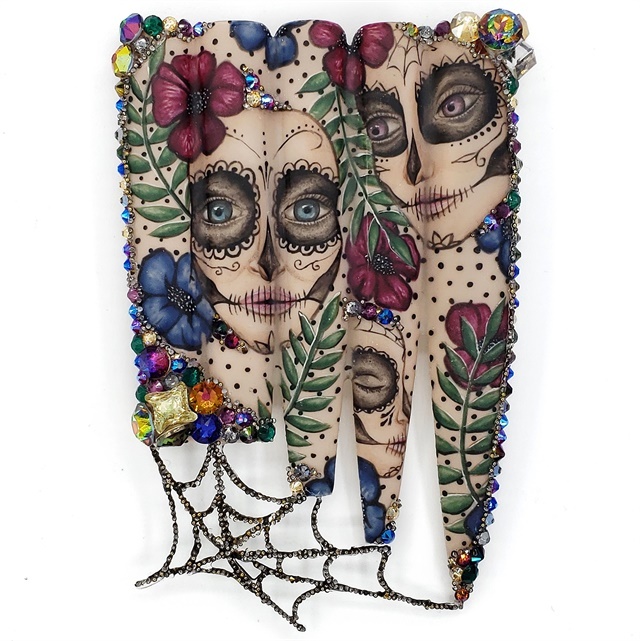 I drew inspiration from this and decided to paint a skull with lines in different colors to represent the bead work. I outlined the skull with black paint to help define the designs. The second thing that draws me to this tradition is the outfits they wear. Lace plays a big part in their wardrobes, with lace veils and skirts made out of paper to mimic lace. So I painted the background black to show contrast against the color and chose white to paint the lace design. I wanted to make the teeth on the skull pop out so I used Swarovski Crystal Pixie dust to bling them up. I finished the design by making the background matte so the details could stand out. 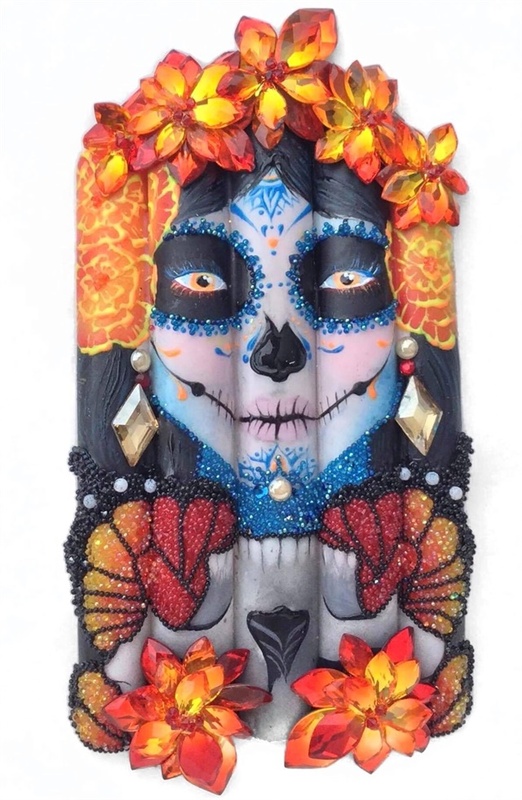 Day of the Dead recognizes that death is a natural part of life, so that’s why I created a skull to mirror the lady with the sugar skull makeup to represent both life and death and their connection to one another. In Mexico, monarch butterflies are believed to be the spirits of their deceased loved ones, returning to Earth, so I fused that in my design. To complete my Day of the Dead design, I painted marigolds and created 3-D marigold-like clusters of fire opal Swarovski crystals. Everything I knew of Dia de Muertos was from watching family movies such as Coco and The Book of Life. Thanks to the help of Wikipedia, I found a wonderful tradition filled with history and love. I read that the custom combines indigenous Aztec rituals with Catholicisim and it was with this newly discovered insight that I was inspired to create a cathedral-style window featuring a sugar skull. 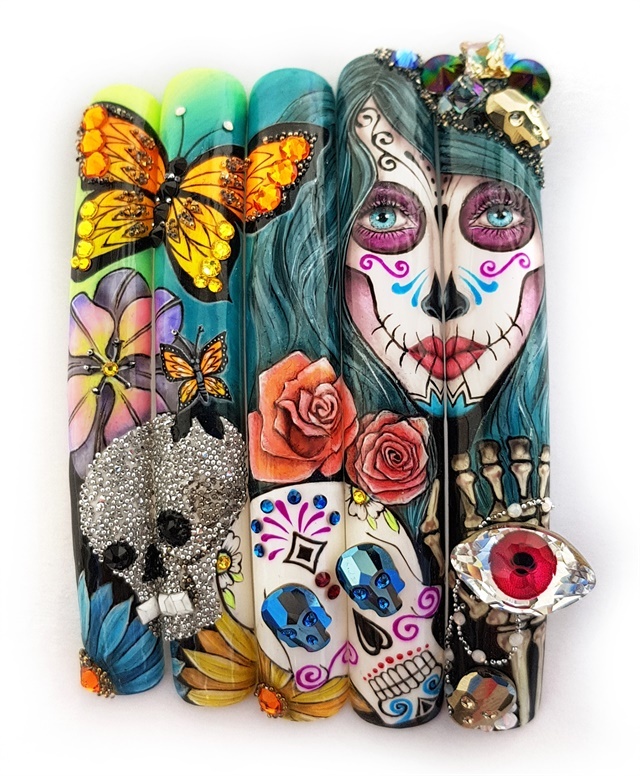 I felt that, not only was it a beautiful representation of the Day of the Dead but also that it could incorporate the recently trending jelly nail. Selecting nail tips that gave me the best overall shape for my design, I drew my base and filled the space with glass gel-polish. Once completely colored I applied hard gel to smooth the design and drew on my outlines/windowpanes. Now it was time to add the Swarovski crystals. These made the perfect addition, bringing my design together with that extra special touch of celebration. For the first pre-challenge, Drop Dead Gorgeous, I wanted to capture the striking beauty of the women of Mexico City who dress themselves in beautiful makeup, clothing, and headdresses to celebrate Día de Muertos, and honor the souls of their deceased loved ones. I was mostly inspired by the beautiful Sugar Skull makeup being done by some of my favorite makeup artists that I follow on Instagram. An interesting fact that I learned, is that even though this tradition dates back to Aztec period, the first Day Of The Dead parade didn’t occur until after the James Bond movie, Spectre, was filmed in 2015, in Mexico City. The filmmakers created a parade for the opening scene of the movie, and it inspired the people of Mexico City to continue the tradition with an annual parade. 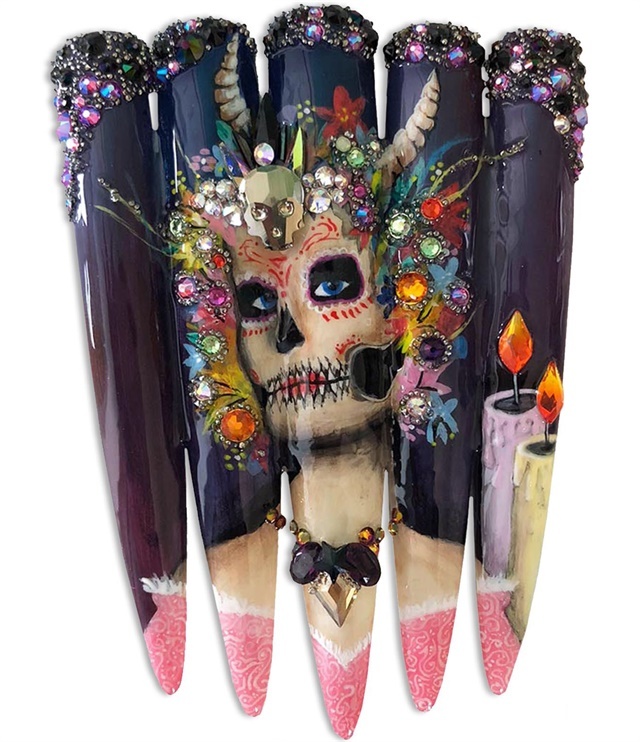 I created my mural using hand-painting techniques with gel paints and gel-polishes, including glow-in-the-dark pigments to give my mural two different looks – one for daytime which is striking and beautiful, and one for night which is haunting and more morbid. I feel that the use of Swarovski Crystals truly enhanced my design to make it a much more glamorous and interesting piece of art. I decided to use a warmer, Autumnal color theme overall for this piece, using red, gold, copper, plum, and orange to match the current season and Halloween festivities. Day of the Dead is a Mexican holiday that celebrates life and life after death. It is said to be the one day of the year where your family comes together again. This is a very colourful time with each colour having a meaning. You will see lots of red (symbolizing blood of life), pink (celebration), white (purity and hope), orange (the sun), yellow (to light the way back to earth), and purple (mourning or sadness). In my piece there is barely any purple, because the woman has come to terms with her relative’s death. I wanted this piece to portray contentment. Since this holiday is to be the merging of life and death and celebration, I wanted the colours and the scene to show this. This challenge was to be bright, but I couldn’t stay away from black. I don’t know if this is influenced by my Western background or maybe my own view of death, but the black, symbolizes the unknown. The cohesiveness of the crystals and the hand painting was very important, I did not want one to overpower the other. Each one is placed so that they would add sparkle where I wanted to highlight my design. The Swarovski skull has a headpiece of Crystals to reflect the woman’s. I always trust my creative mind and after receiving the challenge, this is the image that came to mind. Day of the Dead is a Mexican holiday that gathers family and friends to pray and celebrate loved ones who have passed. I chose to portray a tragic love story across five nail tips. Her face is painted to honor her lover that has passed. There are bright colours, patterns, and gems to represent the altar she would have made in honor of him. Their hands are just out of reach from each other, representing the barrier between them. This theme was so fun to make. My husband and I got married in Mexico, and we have our own special sugar skull to represent that day. I used Wikipedia, YouTube, Pinterest, Instagram and Google to find more details about this holiday. One of my strongest skill is the hand painting, so I was looking for some bold, colorful inspiration. I already had an idea with lots of vibrant one srtoke flowers, such as Mexican marigold and roses and I knew I would paint a woman’s face in the centre of my creation.The hardest part was the crystal placement. They are so beautiful, but some of them are way too big. I started with the background, I wanted to use a lighter grey color instead of a plain black. I made an ombre effect with a soft nail art sponge around the tips. 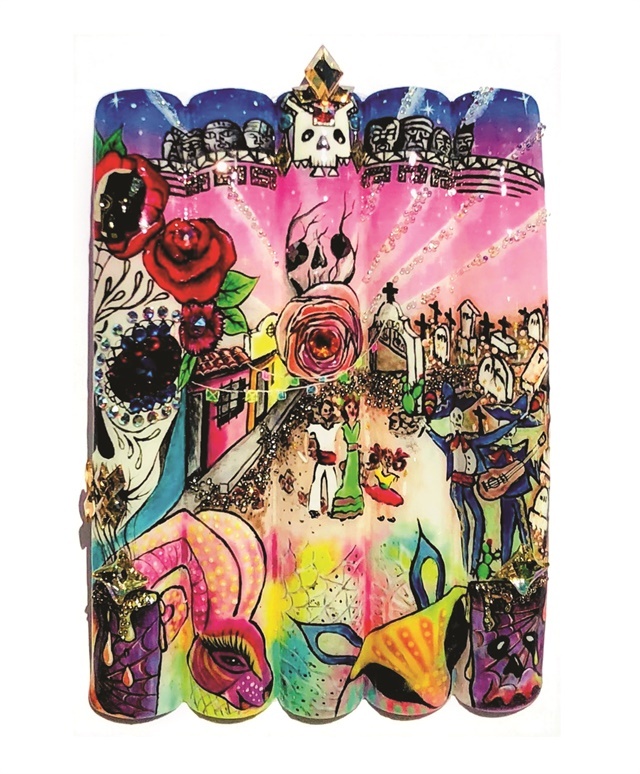 My plan was a hand painted Catrina in the middle of my mural, with a big floral crown and holding a Swarovski skull crystal in her hand. 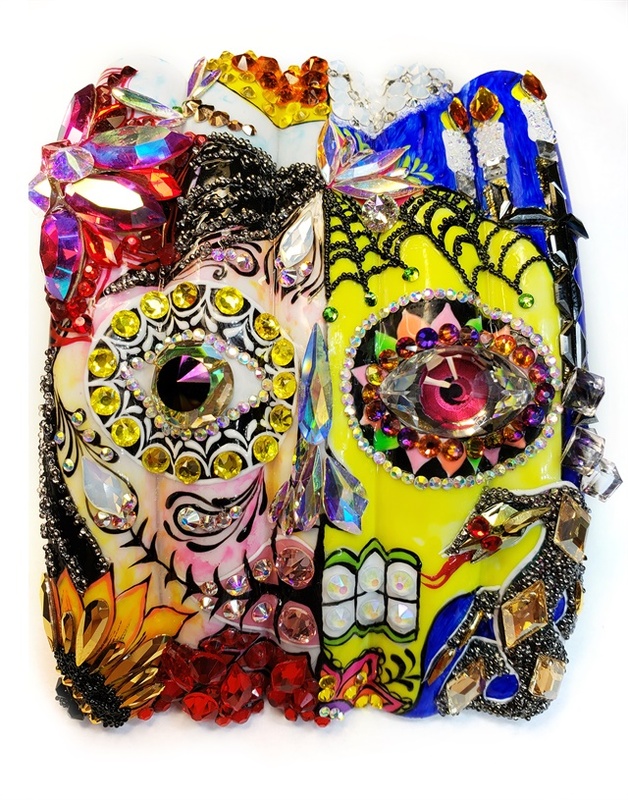 On both of her sides were two sugar skulls, who hold Swarovski skulls in their hands as well. Around these ladies were darker one stroke roses, they represent the dead side of my art. On the top of my mural were colorful flowers, made with acrylic paints to represent the celebration of life. I put my Swarovski Pixies around these colored flowers like teardrops from crystals. I did some research into this and looked at a lot of imagery. I wanted to do something truly beautiful and dedicate this piece to my grandma who passed in the days after I received the challenge. 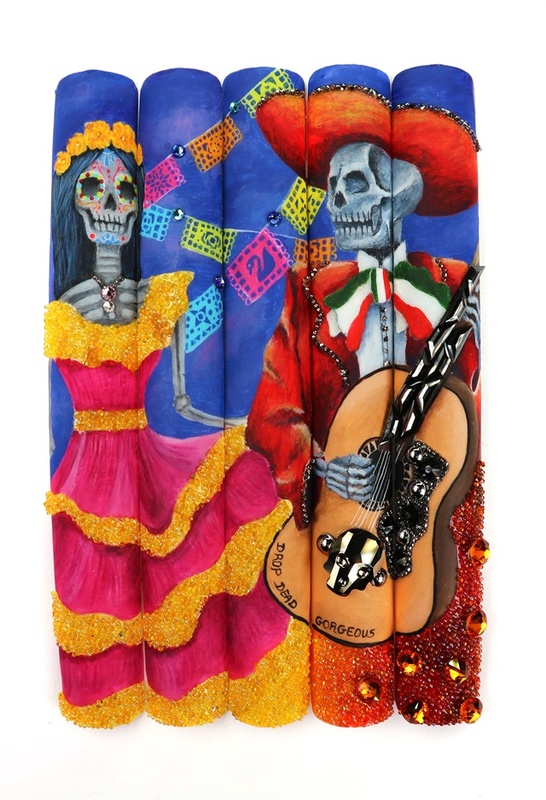 Day of the Dead is a Mexican festival celebrating death and honouring deceased loved ones. 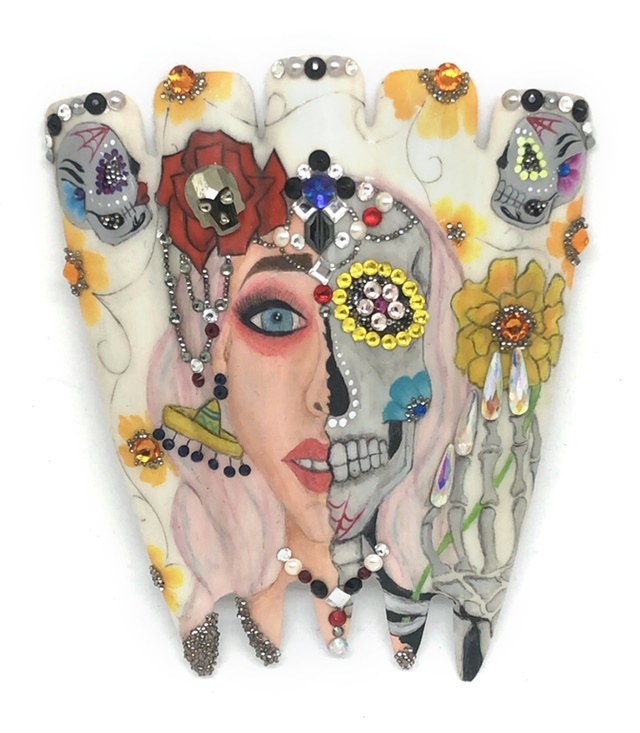 My inspiration for the nails, for this first pre-challenge, came from the juxtaposition between life and death and depicting both within the same image, to create this I designed a face. 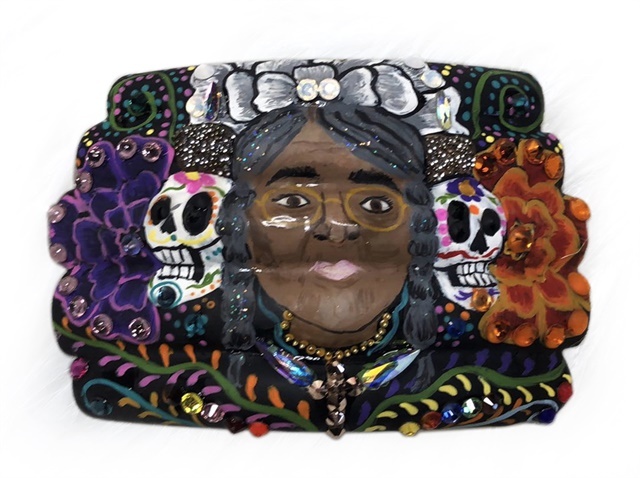 The face in my design is a living face but painted to represent a face of the dead, it is symbolic to demonstrate how our deceased loved ones live on through us and within us, even after they have passed. Marigolds are an important flower within this festival and I loved the symbolism of them and how they are believed to guide the spirits back to us due to their bright colours and fragrance. I really wanted to include these within my design and painted them in multiple colours to reinforce that this festival is a celebration and not a day of mourning. I found a beautiful piece of Mexican folk art that specifically inspired this and I used this to surround the face to bring the piece to life. The beautiful Swarovski crystals were used to bring an extra dimension to the image and complete the overall look. Day of the Dead has a special meaning to everyone. For me, it has always been a special day to remember my relatives and friends who have closed this chapter of their lives and started a new chapter in their afterlife. So with that in mind, I decided to celebrate their lives by creating a unique nail art with the center highlighting their journey into the afterlife. Though it may sound gloomy or morbid, the challenge was to make it festive and colorful like any holiday tradition. I included candles in my challenge because it was a tradition in my family to light candles for the dead. We now bury the dead away from their homes. So the graves are decorated with the idea that the dead return there first. Candles are placed in the cemetery so that the dead will be able to find their way with the guide of the Alebrijes. I included Alebrijes because these painted animal figurines have become a form of symbolic art in Mexico. They are there to guide the dead. But beware, these spirit guides can change to any shape! Above looking down are the ancient Aztecs Gods with Mictlantecuhtli, God of the dead, in the center. Off to the left side is Lady Catrina, Santa Muerte, observing our celebrations. But what is she really watching? When the last candle burns out, everything will be revealed in the darkness! 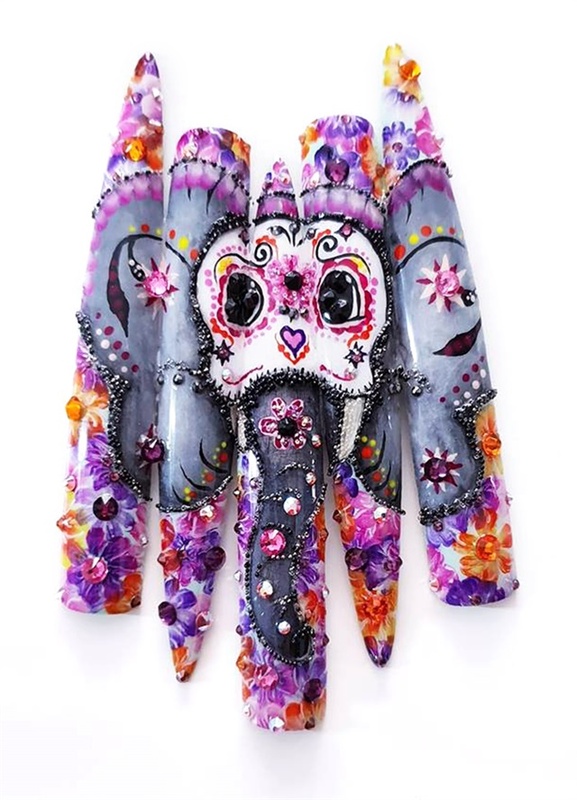 I have painted this living elephant with a mask/sugar skull as a representation of them who have passed away. The elephant is my personal touch to honor my great grandmother. She loved elephants and had one of wood in hear living room. When I read about this tradition I imagined this amazing, powerful, and relaxed animal, carrying my deceased dear ones back to this world on the Day of the Dead.The elephant is for me also a symbol about my hope to remember and see some of my dear deceased pets, since pets also can have a big space in the hearts of a family. I have painted the flower “tagetes” since it’s the favorite of the dead. I chose more colors than their original read and yellow shades to emphasize that this day is a colorful celebration day. The quality and beautiful Swarovski crystals are used for a finishing touch. The title of the challenge made me envisage a beautiful woman suspended between two worlds, the living and the dead. Of all the beautiful Swarovski crystals supplied to us I was particularly captivated by the crystal eye and decided to use this as the starting point to my piece. I have always had a morbid fascination with skulls and the single eye seemed to tie perfectly with my concept of half alive/half dead. I played around with my nail tips many times, rearranging them until I saw pointed teeth at the bottom and tall, imposing altar candles at the top. I used a traditional colour scheme of hot pink and orange and included native Mexican flowers in the form of a headdress. 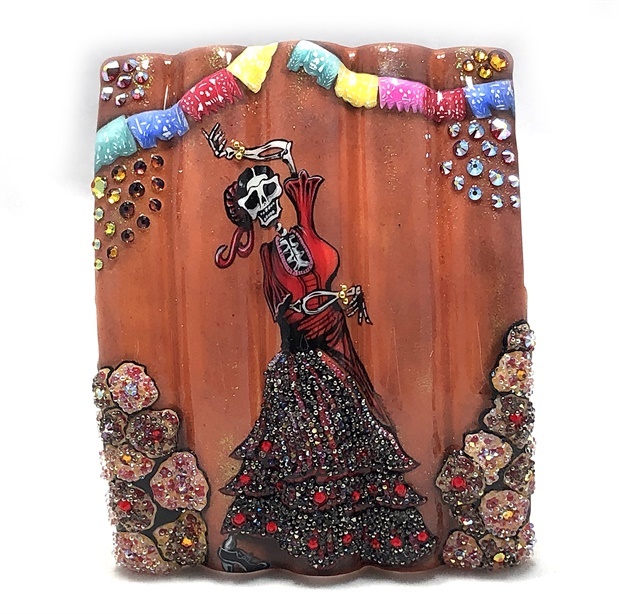 The skeletons on the altar candle are built from a combination of Swarovski crystals and are symbolic of Santa Muerte (the personification of death) and Guadalupe (The virgin Mary.) 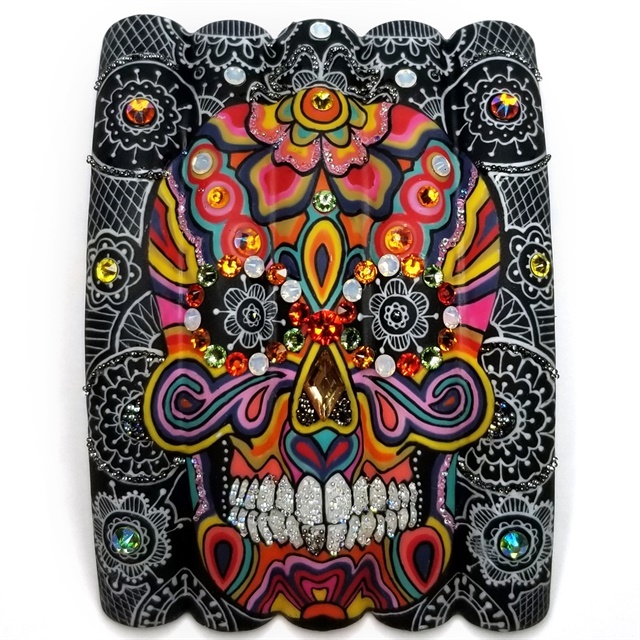 After carefully hand painting my piece, I embellished it with patterns and crystals in the style of a traditional sugar skull. To show the celebration of life, I painted a living lady and for the celebration of death, I drew the other half of her as a skeleton. I painted some marigold flowers as they are one of the most recognisable symbols of Day of the Dead. Another iconic symbol of the Day of the Dead is the Sugar Skull so I added two of these to my design. These skulls are said to capture joy while reflecting the happy memories associated to the lost loved ones. As I was studying this celebration, I was impressed by the bright colors and their way of facing death. The principle associated with this celebration is the thought that mourning the dead is disrespectful. It is believed that during Día de los Muertos, the deceased temporarily return to earth to become reunited with friends and family. I wanted to depict this joyful event with a great hand painted fiesta. Dead people that returned to earth are happily dancing and playing music! I painted my mariachi in red uniform to represent the passion and desire for happiness. His guitar is encrusted with a combination of Swarovski crystals and Crystal Pixie. The woman’s dress is also encrusted with Sunshine Kiss crystal pixie. To complete this festive piece, I decorated the background with “papel picado” a decorative craft cut into beautiful and elaborate designs. One of my papel picados is cut in ours sponsor’s logo. Our pre-challenge is special to me. When I was 16 we were all given an assignment. It was Dia De Los Muertos. I thought nothing more then oh cool we get to be creative with color. As well as art related to my culture. A week later we had a filed trip to a local folk art Gallery in Fresno, Calif. As I’m looking at all the amazing art I stop. Absolutely shocked to see my art. My art teacher loved it so much she showed the director of the gallery. He loved it so much he put it up for display. This was such an incredibly fun challenge for me because I am actually from Mexico City and this is absolutely one of my favorite Mexican traditions.The Day of the Dead is basically a feast for the eyes so there were many different areas from which to take inspiration. I chose to focus on the spirit animals known as alebrijes. They are beautiful figures usually carved out of wood and are known for having very ornate detailing and bright bold colors. I attended the festivals for many years growing up with my grandmother. Every time we went we both always got new alebrijes. I always chose a cute different animal but every time we went my grandmother chose a frog. For that reason, I chose to base my mural on the alebrije which reminds me of my grandmother and attending those festivals. This is my tribute to my grandmother, Rosa Vargas, so like the traditional altars I wanted to make sure and include representations of marigolds made from Swarovski elements and assembled with builder gel. 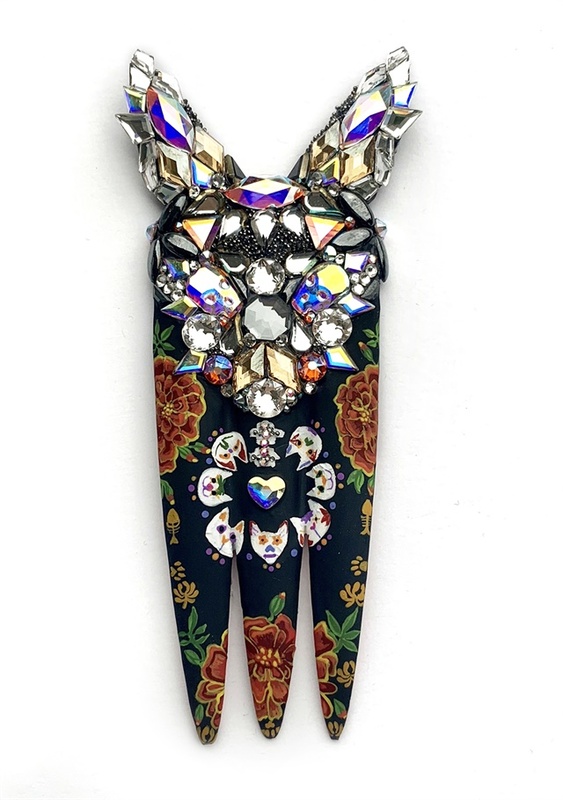 Since the main focus of my piece was the hand painted frog assembling a crystal spider seemed like a good complement. Crystal Pixie was key in creating the fine points on the end of the spider to give it a more realistic look. The product is so fine it really lends itself to being used as anything from a filler for the centers of flowers to being used to create the fangs of the spider. They’re also fine enough to line a web without distorting the linework and still give off quite a sparkle. The whole purpose of the Day of the Dead festival is to remember and honor your loved ones and I’m so happy to have this platform to be able to remember and honor my grandmother and create something beautiful for y'all.